The trend originated from Motor Boats and WWII airplanes found its way into the Custom Car and Hot Rod scene in the 1950s. It is still going strong today. Ron Aguirre’s 1956 Corvette “X Sonic” Painted by Larry Watson. 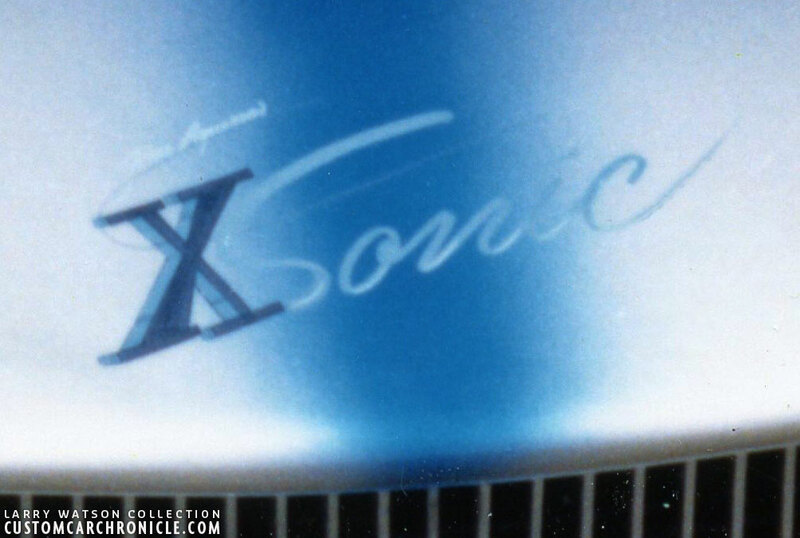 Close up of the Ron Aguirre X Sonic name painted on the car by Larry Watson. 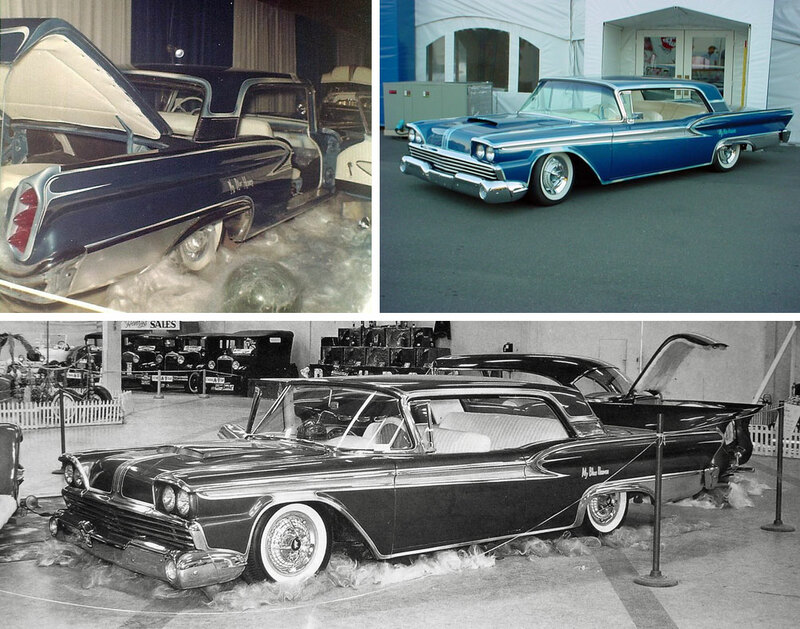 Custom cars have been given names by their owners since the early 1950’s car shows. 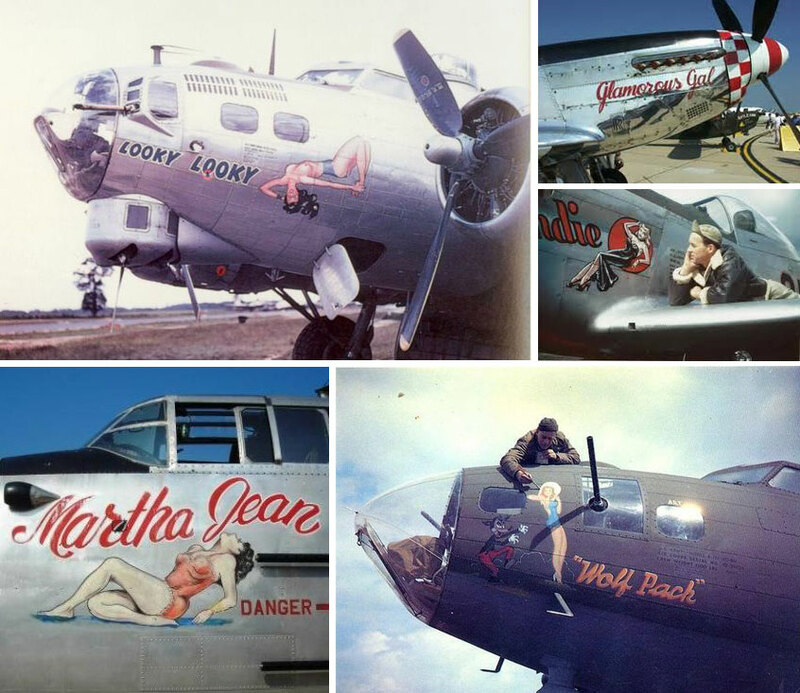 The practice probably got started in WWII when affectionate names got painted on the nose of military aircraft by young GI’s. Pleasure boat owners have always sought to personalize their water craft by giving them an identity with a special name. 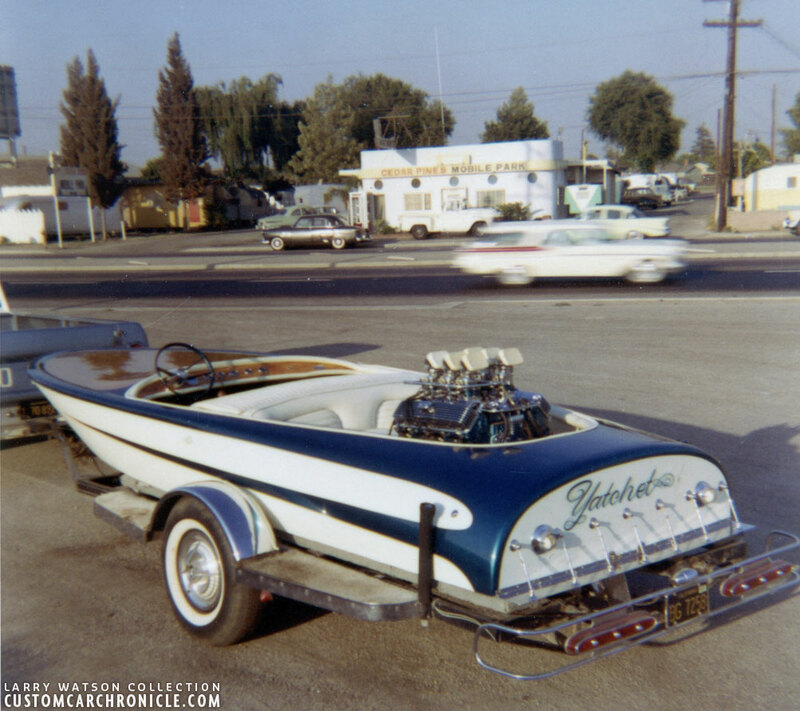 So it was only natural that custom car owners would eventually put a name on their “dreamboats” too! Larry Watson painted boat named “Yatchet”. WWII aircrafts with names painted on the nose may have been the inspiration for naming hot rods and customs. There was a period from about 1958 to 1961 where guys started having the name of the car painted on the quarter panels or some other obvious spot. I think that this went along with the trend for wild and creative pin striping that was started by Von Dutch and continued through the Larry Watson era. 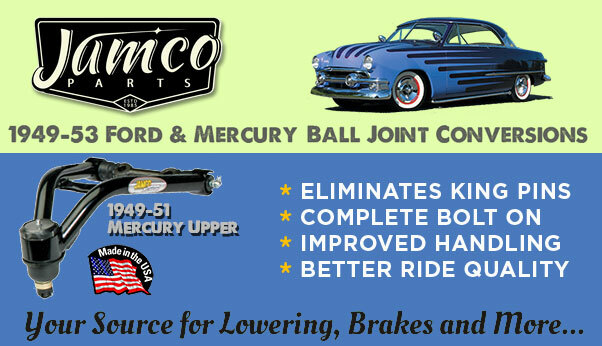 Larry Watson did the scallops and the graphics on Jim Jackson ’56 Chevy. 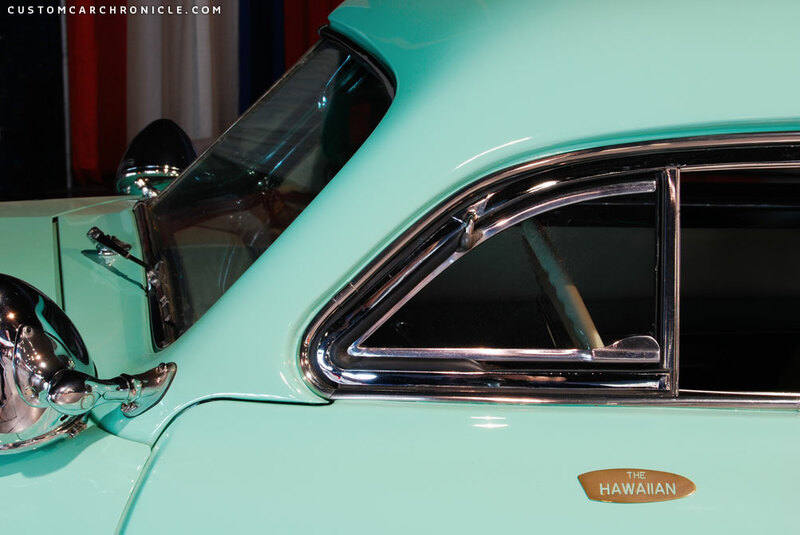 Jack Stewart’s “Polynesion” sectioned ’50 Olds hardtop by the Valley Custom Shop. 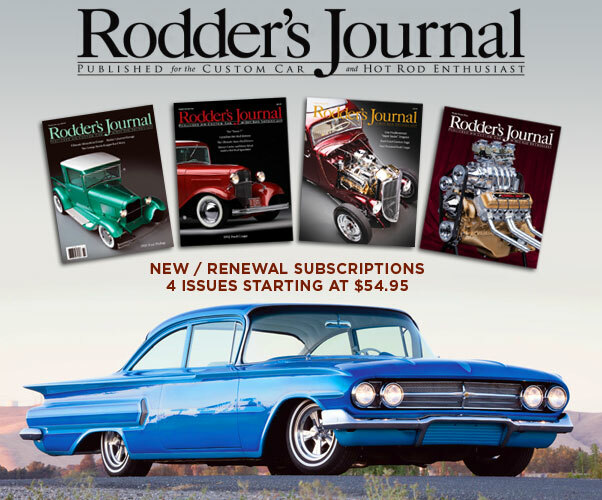 One of the first customs that I noticed with a name was when the sectioned Olds hardtop built by the Valley Custom Shop was on the cover of Hot Rod magazine. It was named “Polynesian” which seemed like a pretty cool name to me. 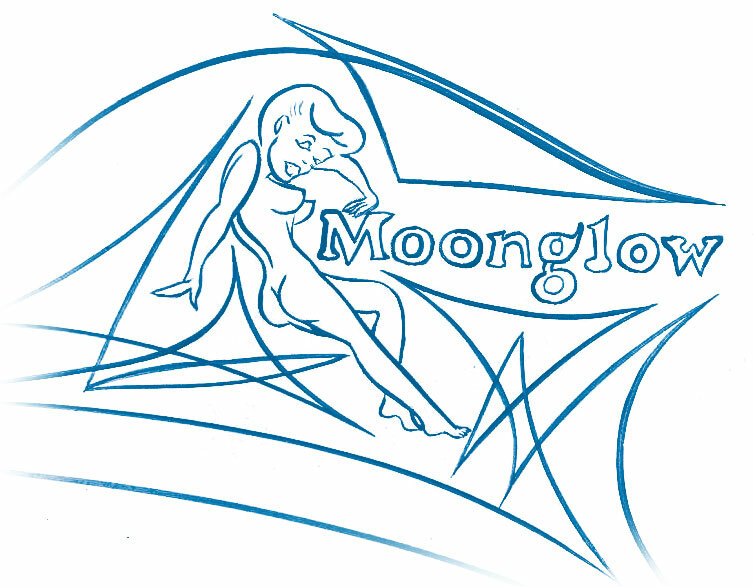 Another name that was especially memorable was Duane Steck’s full custom ’54 Chevy called “Moonglow”. That always seemed like the perfect name for the low, heavenly looking, white and blue’54 Chevy hardtop. “Moonglow” was the perfect name, in my opinion, for Steck’s custom Chevy. There are lots of options for a car’s name. Appearance or design features are often behind an owner choosing a name. Sometimes a hot engine or special mechanical equipment gives impetus for a car’s name. Rock or popular song titles, movie stars names were used back in the day. Many times the paint colors are where an owner comes up with a car’s name. 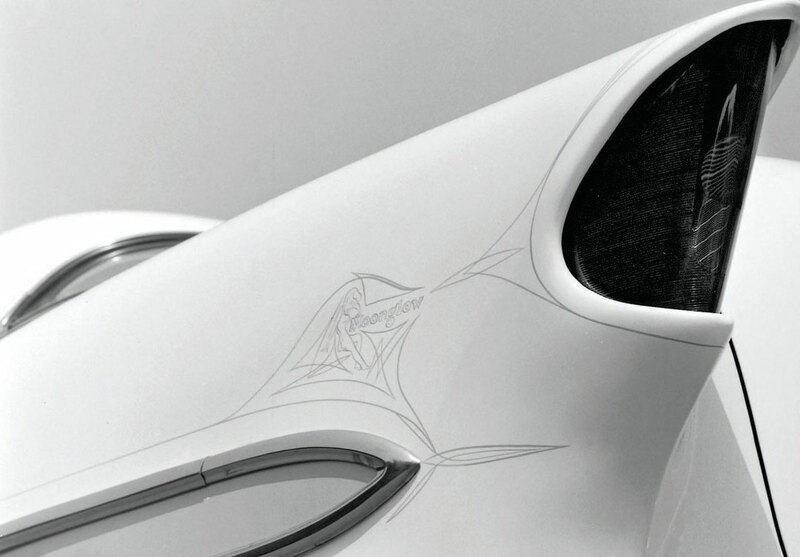 However, sometimes an owner just wants to make a statement about the car’s persona. There were also times when an owner wanted to make a personal statement about himself in his car’s name. 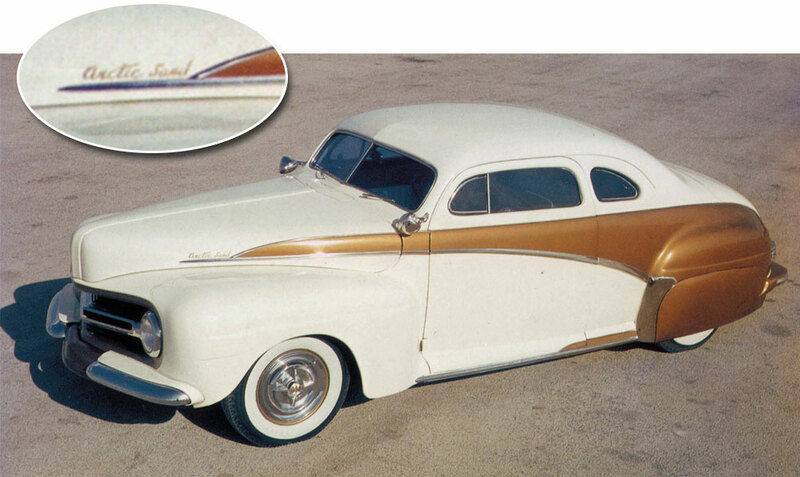 Another early name on a Custom was “Artic Sand” on Kenneth Peterson’s 1946 Ford Coupe restyled by Clarkaiser. 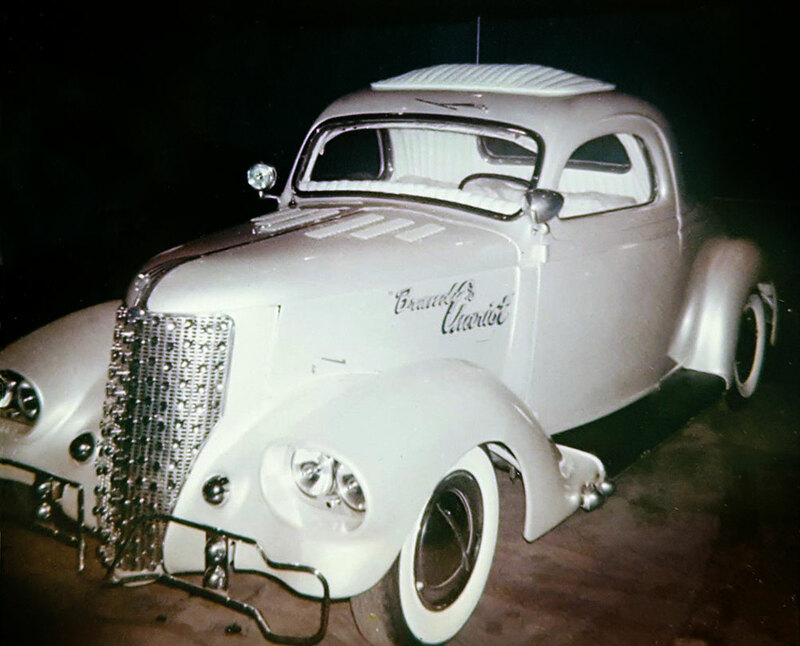 Willian Block’s 1936 Ford “Brandy’s Chariet”. Here are some examples that come to mind on different car names. There are many names that fit in each category but I just wanted to give a few examples. Colors: The sectioned 1959 Ford, My Blue Heaven, from Oregon had its name proudly painted on the rear quarter panel. 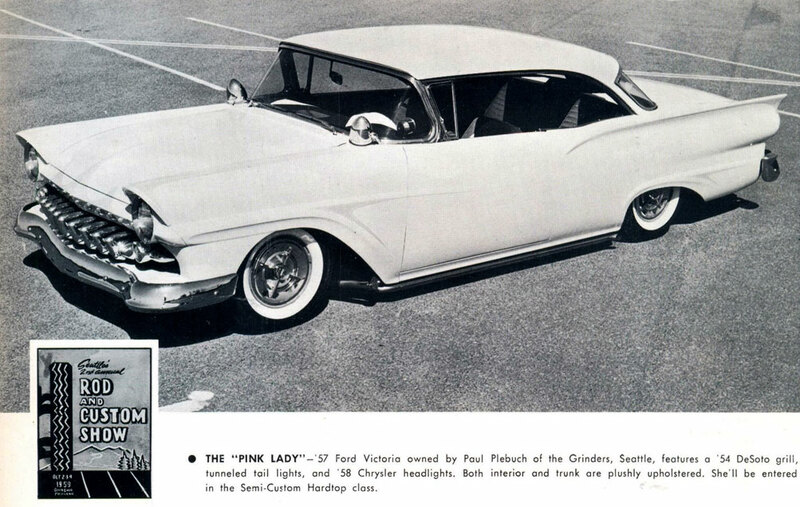 There was a ’57 Ford hardtop in Seattle around 1958 known as “The Pink Lady”. The “Jade Idol” name seemed really appropriate for that ’56 Merc with the multi-green color scheme that Gene Winfield put on it. 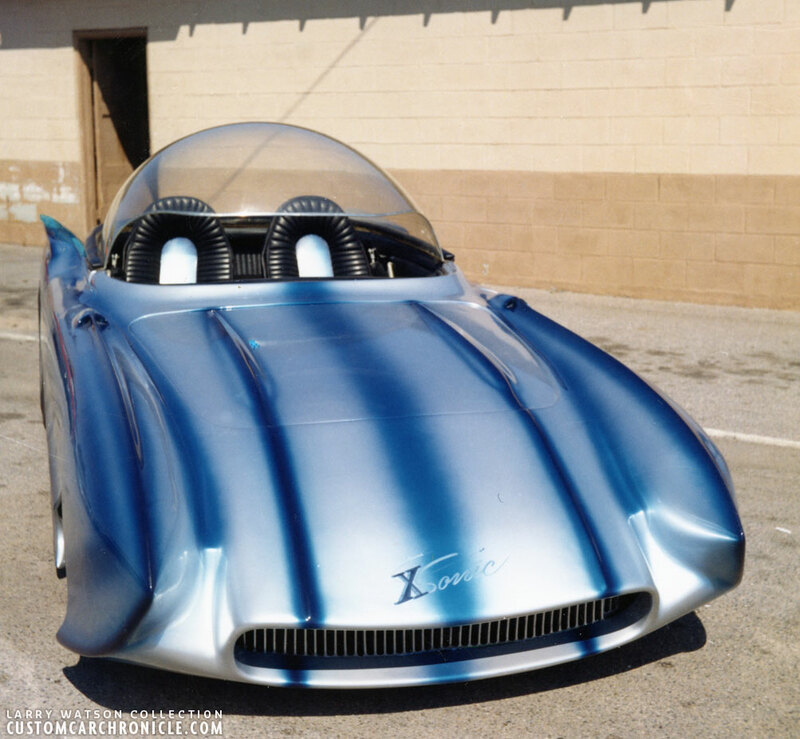 Joe Bailon’s “Candy Bird” Thunderbird was another great named based on the candy apple paint job. Lyle Lake’s 1951 Buick was appropriately given the “Blue Danube” name. Gil Clifford came up with the name “Red Rage” for his sectioned ’56 Buick. 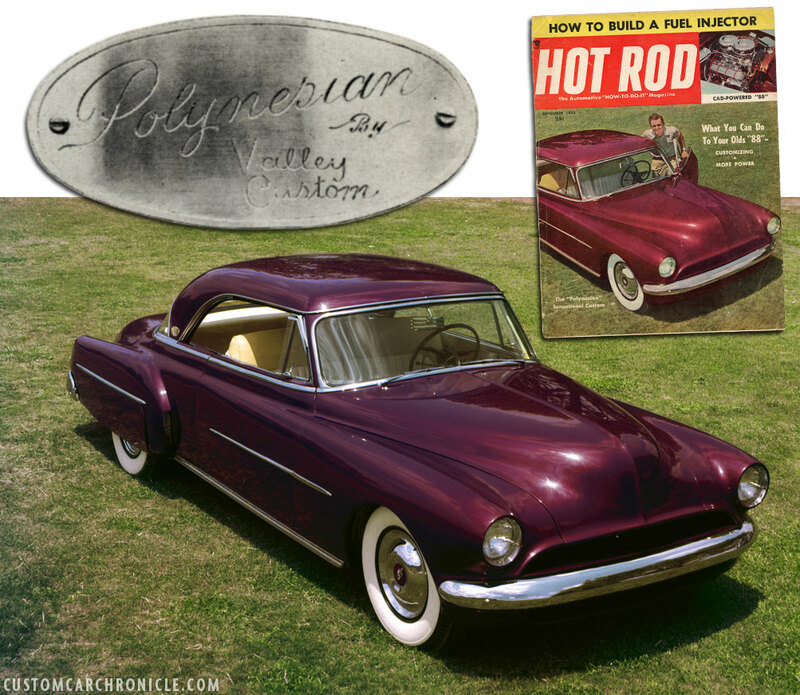 Larry Watson thought up the name “Grapevine” for his grape colored ’50 Chev two door sedan. These are just a few of the color based names I can think of. Naming a car for its color is perhaps the most common inspiration for a name. You can probably think of lots of other examples for this category. The “Pink Lady” ’57 Ford was a popular show car around 1958 in Seattle. Chuck Atwood’s 1959 Ford “My Blue Heaven” was painted ’56 Dodge Royal Blue and had its name painted on the rear quarter panel. The car was restored by Ron Sanders. 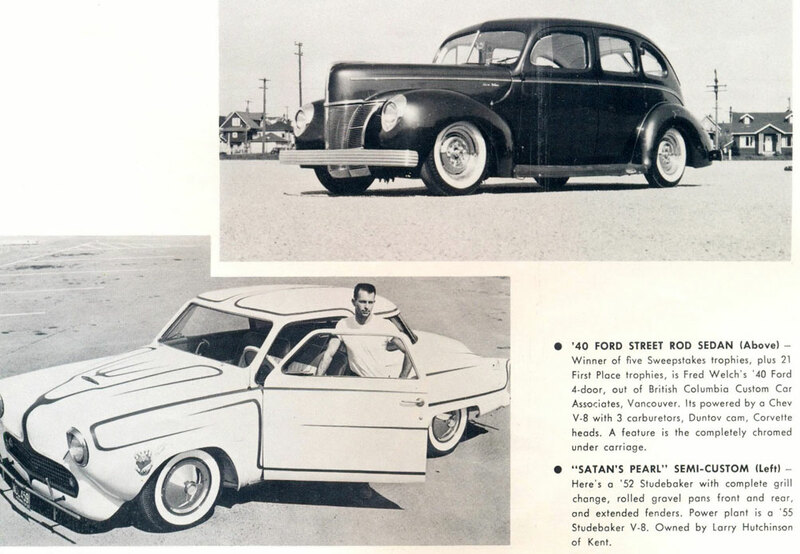 “Satan’s Pearl” ’52 Studebaker from Kent, WA and the ’40 Ford sedan called “The Treasure” from Vancouver, BC. Madame Fi Fi was a flamboyant name that set it apart from the more ordinary names. Madame Fi Fi, the Seattle “show queen” , was named for its F. I. (fuel injected 1957 Chevy engine). The outrageous name set the stage for the series of “radical” modifications that would follow in the years after the engine was installed. Joe Bailon appropriately named the customized ’58 Impala “Scoopy Doo” for its multitude of scoops. Dave Stuckey’s “Little Coffin” ’32 Ford sedan had a boxy, coffin shape to it. 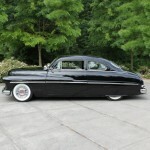 The Alexander Brothers used the name “Victorian” for their beautiful ’55 Ford named after its Crown Victoria model name. El Matador was a good choice as a name for Cushenbery’s wild ’40 Ford. It created a statement about the car’s presence, attitude, and bravado. 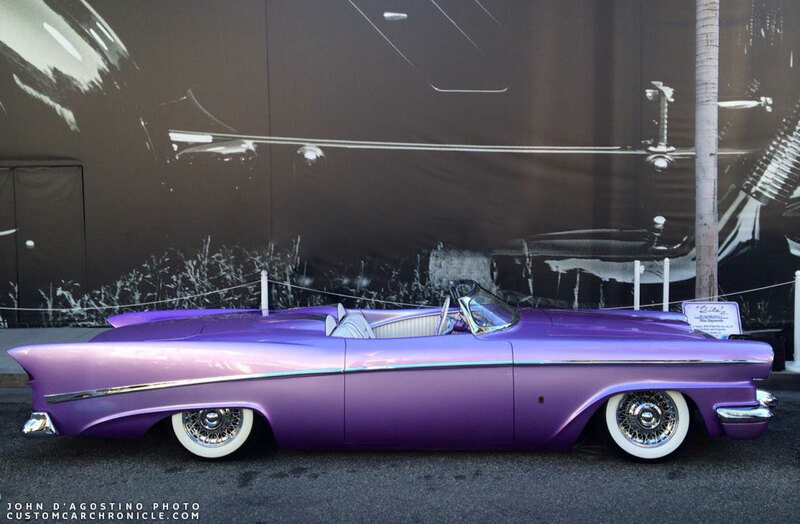 Barris’ name “Aztec” seemed to make a perfect statement for that very famous and radical ‘55 Chev convertible. The “CadZZilla” name combined the make of the car with a statement about its sinister, monster look. 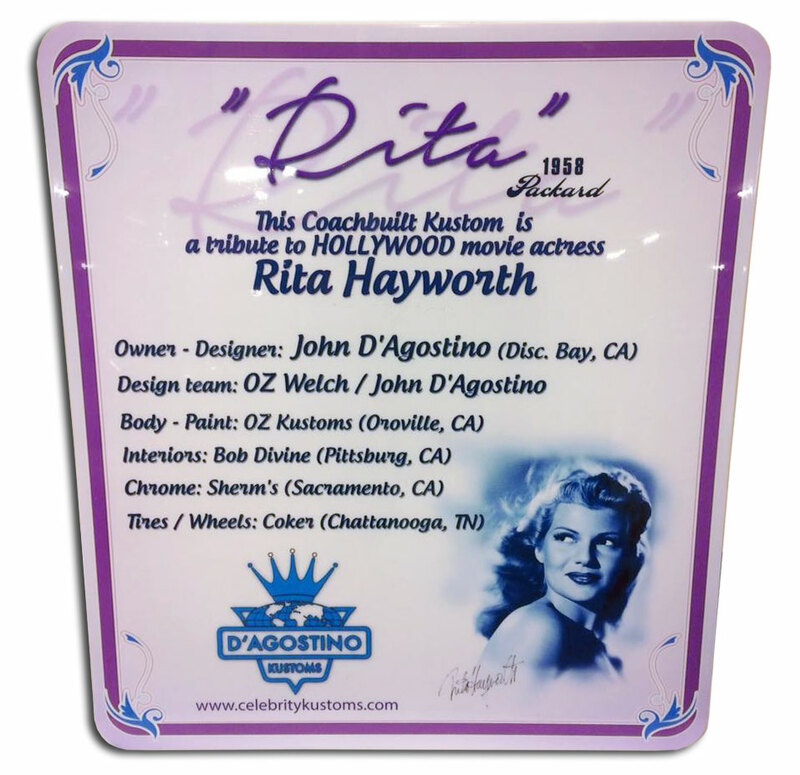 “Rita” is one of the latest of John D Agostino’s customs named for famous movie stars of the ‘40’s and ‘50’s. John D Agostino has been titling his beautiful custom creations after famous movie stars. Gable, Marilyn, Rita and others give the elite character and a sense of the era that the car’s design fits into. There was a local car from Washington called “Party Doll” after the song title. Lots of rock and roll songs provided names for everyday and custom show cars. The Hirohata Merc was given the name “Hawaiian”. There was also “Desert Beauty”, Parisienne, Artic Sand, plus many other names that fit into this category. Special made nameplate “The Hawaiian” on the Hirohata 1951 Mercury. 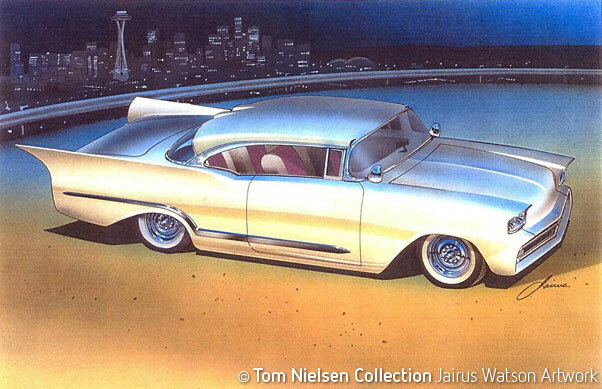 In the mid to late 1950’s Renton’s Gary McCann owned a cool ’41 Chev coupe. His friend Dan Holms, also from Renton, WA, owned the ’41 Chev next and added some changes and detailing. When Dan entered it in the Fifth Annual Tacoma Rod and Custom Show, he gave it the name “Wicked Ruby”. 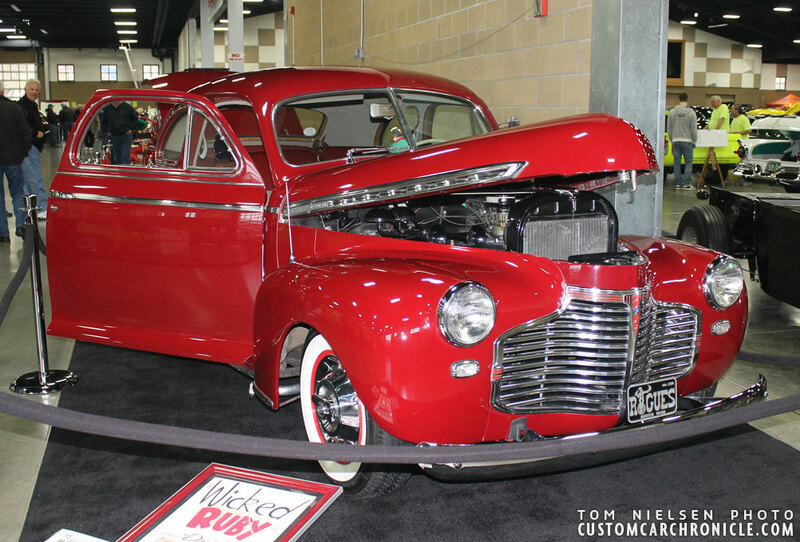 Mr. Holms has accurately recreated the ‘41 Chev coupe and the name “Wicked Ruby” has been revived! “Wicked Ruby” at Tacoma Rod and Custom Show 1959. 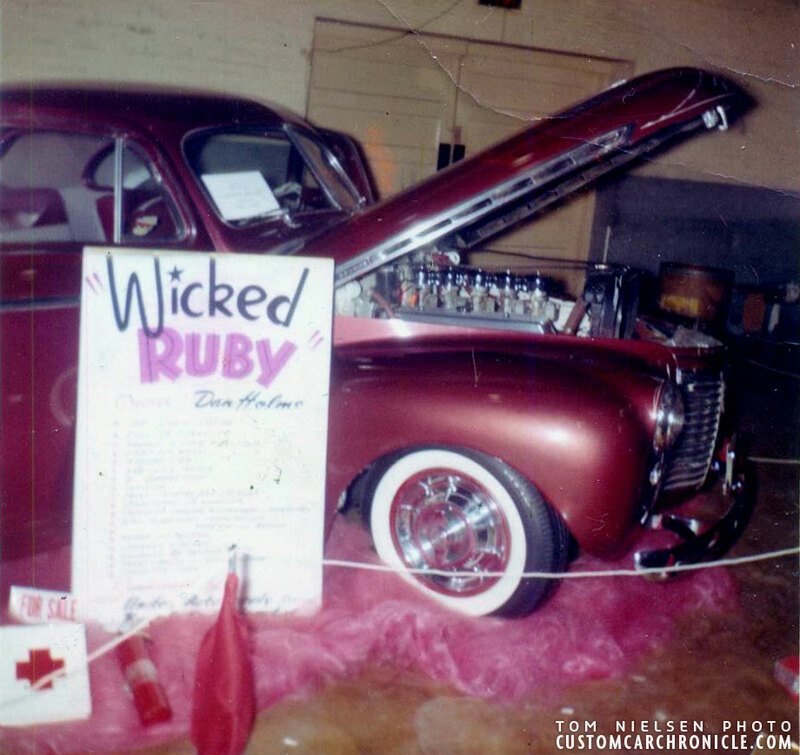 “Wicked Ruby” displayed at the Northwest Rodarama in 2014. In summary, naming custom cars has been going on for many years and continues to be an important part of many new custom creations today. We remember cars that we like often more by their name than by the owner or builder’s name. I’m sure if you are reading this you can think of many car names that have been both inspirational and appropriately given to customs both then and now. Well Done Tom. Sure takes you back. Customizing, all about individualizing YOUR car. Making a statement. And how better than to christen that singular statement with a name. Not just any name; THE name, one that sets it..and you..separate from the cookie cutter, tickey-tacky world of anonyminity. So glad to see the Polynesian up front and center. Thanks, Tom. Some of the names given evoke a certain aura but in the case of the El Capitola, I could never quite figure that one out. Some claims has been made that it was named that because Sam was living in Sacramento by that time which is the state Capitol of California. 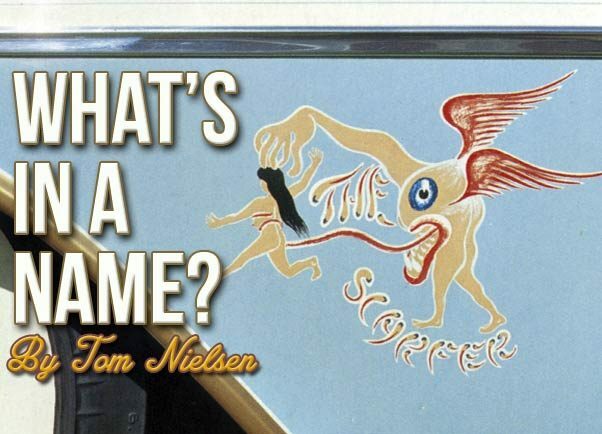 Great article Tom! I love cars with names, I’m calling my 25 Model T coupe the Crimson Dynamo after a character in a Paul McCartney song and our T-Bird will be the J-Bird after current and past owners, (Josh, Junior, John and Judy) or Lemon Meringue because it will be Pearl Yellow with White top, and of course the Chevy already has a name! Interesting article Tom! I named my DeSoto “Delilah” for a couple reasons. 1- I have always loved the name. 2- It fits with the old adds- “It’s delightful, it’s delovely, it’s DeSoto!” And 3- I wanted to name it after a woman because it’s given me so much trouble over the years! My 54 Ford custom convertible is called “Gypsy”. I’ve seen it used numerous times on custom cars over the years. The reason I believe is, gypsy’s are travelers and always on the move. Mine is for a completely different reason. My last name in the Slovak language means “Gypsy”. Therefore, I’m not plagiarizing the name and feel entitled to it. That’s my story and I’m sticking to it. thanks Tom…i have bin thinking lots about this for my cadillac. ´The Palle Johansen Cadillac`….no…doesnt sounds right. i remember when Tim, Rik and I was talking about Tims 39..we had no doubt that it should be named: The Kirkegaard Mercury…and this is the name that sticks to that car no matter who is the owner.